Heads up as you pedal through UW campus: beginning Saturday, Jan. 17, the Burke-Gilman Trail will detour between Latona Avenue NE in Wallingford and Adams Lane near the University Bridge. Seattle City Light will be installing an electrical conduit and says this is the last phase of their electricitrical upgrade project. Work is scheduled to finish mid-February. The work has a planned start date of this Saturday, January 17 and will last until approximately mid-February, 2015. Pedestrians will be detoured onto sidewalks while cyclists will be detoured onto pre-existing designated bike lanes and lanes to be set apart in current traffic lanes. In the latter case, cones bolted to the asphalt will separate cyclists from traffic. For roadway adjustments to protect bicyclists, see Burke-Gilman Trail detour insets on map (below). Signage will direct cyclists and pedestrians at waypoints along the detour route. See example signage (right). 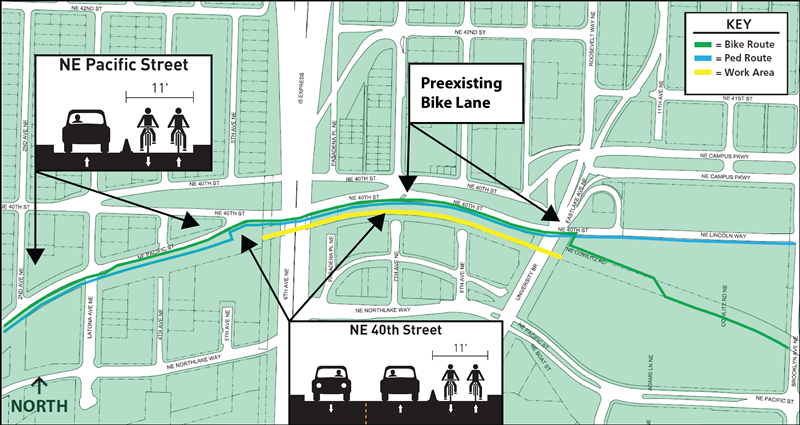 The conduit installation has been coordinated with the UW’s own trail improvements to east of 15th Avenue NE. More information can be obtained on City Light’s project website. Customers can also contact Patty Breidenbach, Electrical Service Representative, (206) 684-4795 and patty.breidenbach@seattle.gov.